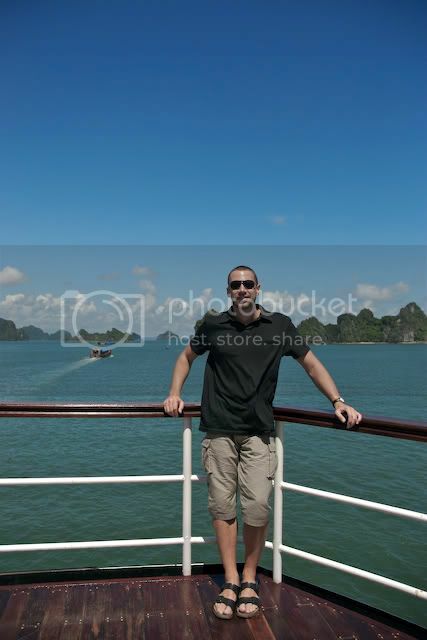 The next stop on my tour of Vietnam was Halong Bay, along the northern coast of the Gulf of Tonkin. I had originally intended to visit the town of Hue and tour the Imperial Palace and Perfume River, but flights didn't work out so I headed North instead. 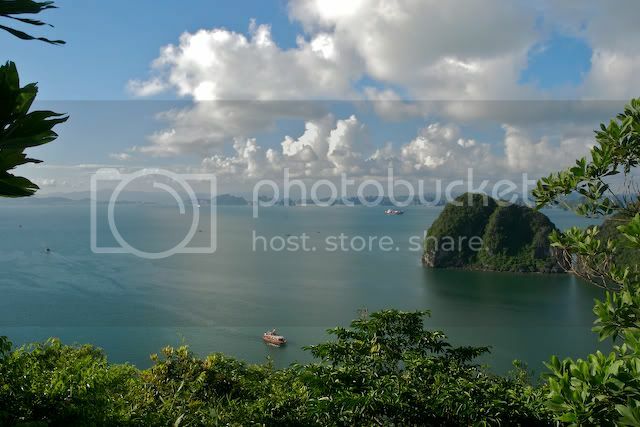 Halong Bay is a vast collection of over 2,000 small limestone islands, each jutting amazingly out of the water and covered with dense jungle. Many of the islands contain vast caves, small isolated beaches and abundant wildlife. The scenery itself is very similar to that in Phang Nga in Thailand (the home of James Bond Island). In my opinion, Halong Bay was much prettier and far less touristy. 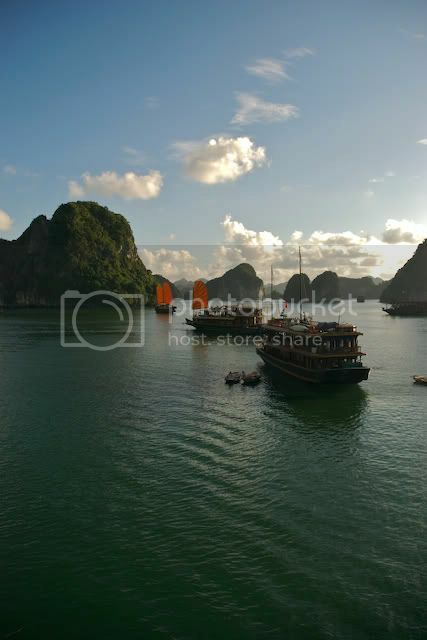 Halong Bay is about a three hour drive from Ha Noi, the capital city. Many tour operators offer excursions from Ha Noi that include round-trip transportation, a cruise of the bay (often overnight) and a trip back. The cost is about $300 for a two-day outing, but its well worth it. The most popular tours are "Junk Tours". A junk is a traditional Chinese or Vietnamese sailing vessel with large, fan-shaped sails. Today's junks look like the traditional boats but the sails are largely for show as the boats are mostly diesel-powered and have many modern amenities including air conditioning, restaurants and bars. I've never been a big fan of taking a cruise (in fact, I never have) but these small boats hold about 60 people so its not the Spring Break Madness you might encounter on a typical Carnival or Princess cruise. Another option is small line of luxury French boats, one of which is the Emeraude. 130 years ago, the Roque brothers built a successful business supplying the French during its establishment of the Indochine colonies. In addition to their fleet of merchant vessels, the brothers started a luxury cruise line of paddle boats to offer sightseeing tours along Halong Bay. The original boats were very advanced for their time, having en-suite bathrooms, electric power and crude air conditioning. Today's Emeraude boats are brand-new recreations of the original fleet, only the paddle is just for show. The boat is quite nice, sort of a floating Four Seasons. Once you get on the boat, there isn't much to do but relax, drink champagne and look at the scenery. After about 4 weeks of non-stop touring, this was a nice break. The weather was perfect, especially given July is the heart of the rainy season. 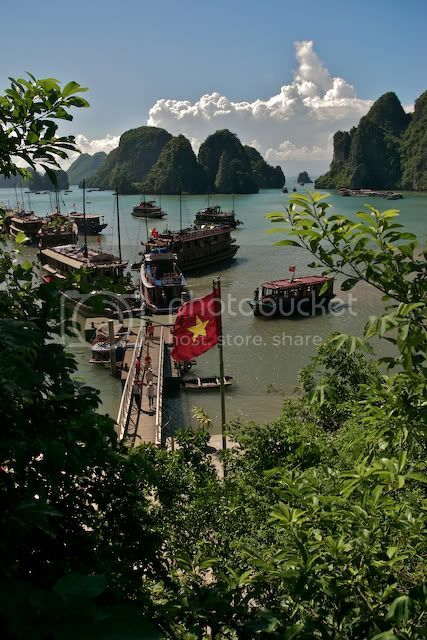 I have friends who have visited Vietnam and Halong Bay on many occasions and were stymied by the weather each time. I was lucky. Halong Bay is on the verge of becoming a major tourist attraction for visitors to Vietnam and the region. Its interesting to watch the development as the Vietnamese aren't quite as good at hosting tourism travel as other parts of Asia. The facilities are often decent, but the service can be a struggle. I suppose that given Vietnam still has a relatively immature tourism industry that this will correct itself over time. To-date, there aren't any of the major high end players in Vietnam like Four Seasons, Ritz Carlton, Peninsula, etc. The Park Hyatt Saigon and Sofitel Metropole (Ha Noi) are notable exceptions. Western firms are still a bit skittish about making major investments in Vietnam, and this includes the hotel and resort industry as well. Contrast this with Cambodia, which is far ahead in developing its tourist accommodations to better visit the attractions around Angkor Wat and surroundings. I predict you'll see far more options with more sophistication in the future, but for now Vietnam does "backpacking" and moderate cost travel quite well. I don't mean this to be a criticism, just an observation. As Vietnam opens itself up further to more tourism, this could be a big opportunity, but its also likely that Vietnam will lose much of its rustic charm as a result. Visiting Halong Bay reminded me of my two trips to Costa Rica. When Tod and I visited Costa Rica the first time in 1999, much of the fun was how rustic and undeveloped the country was. When we returned in 2002, I was amazed at how much had changed in just three years. There were highways where no roads existed before, entire resort communities where pristine coastline existed prior and vastly more visitors. I suspect Vietnam is at a similar crossroads now, much like Thailand was about 40 years ago before becoming the tourist mecca it is today. There aren't too many places like Vietnam left in the world, and you should see them soon before they open their first TGI Friday's, Starbucks or Gap.